Aizome (藍染め) is a Japanese dyeing technique that is hundreds of year old. “Aizome” means “indigo dye”, referring to the rich blue color. Ryu Mei offers six different patterns, each with its own unique, beautiful design. 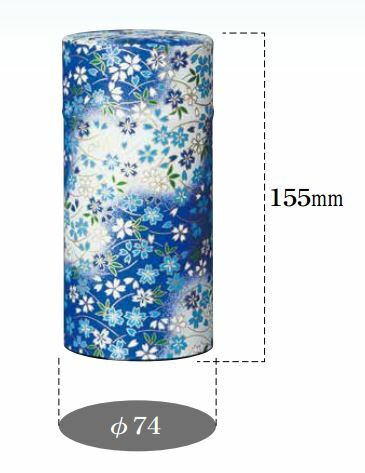 These canisters are covered with washi, a traditional decorative paper. The airtight lid included can keep tea fresh for a long time. I purchased 4 of these to give as part of my bridesmaids' gifts. They arrived quickly, were well-packed, and they're gorgeous! I'm sure my ladies will love them (I'm actually kind of jealous - I wish I'd gotten one for me!). Vey pretty canister, good price, speedy shipping! I am delighted! Extremely nice canister, and deliered quickly! Thanks! Lovely canister, speedily shipped, well priced. I am very pleased! Very handsome canister, price OK, and delifery very fast. Many thanks! Exceptionally nice item. Fast service. All good. love my purchase!!! great service thankyou !!!! Lovely canister, arived in great condition. Thanks! Sturdy design and large size canisters are perfect for my storage needs!